Major publishers are devoting themselves to producing audiobooks of all of their front-list titles and it appears to be working. In the first three months of 2017 digital audio sales increased by over 28% and it generated over $74 million dollars. The industry had high hopes that e-book sales would stabilize or reverse the downward trend from the past three years. Sadly, this is not the case as e-book sales declined 5%, but the format generated a respectable $281 million dollars in revenue. Revenues for book publishers were $2.33 billion for the first quarter of 2017, a $108 million (4.9%) increase over the first quarter of 2016, according to the StatShot report from Association of American Publishers. Much of the growth is attributed to increased revenue in the two of the largest categories – Adult books and higher education course materials. 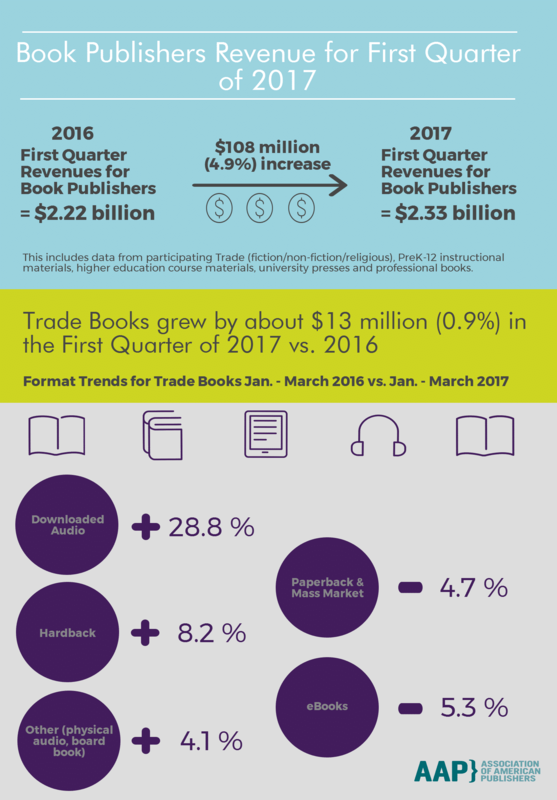 In the first quarter, trade books grew by about $13 million (0.9%) compared to the first quarter of 2016. Growth was consistent in January, February and March for Adult books as were the declines in Children’s/Young Adult and Religious Presses. Publishers saw about $12 million in increased revenues from print books, mostly due to an 8.2% growth in hardback books, from the first quarter in 2016 to the first quarter in 2017. Revenues for digital formats were mixed, with downloaded audio growing 28.8% and eBooks declining by 5.3%. Both education and scholarly publishers saw some increased revenues during the first quarter of 2017, compared to the first quarter of 2016. Revenues for Higher Education course materials were up by $92 million (24.3%) to $470.2 million in the first quarter of 2017 compared to the first quarter in 2016. Revenues for Professional Publishing, which includes business, medical, law, scientific and technical books, were up by $5 million (4.5%) to $119.5 million. Revenues for PreK-12 instructional materials declined slightly by 0.7% from $242.7 million to $241.0 million in 2016. University Press revenues were down by $309,000 (2.4%) compared to the first quarter of 2016.